Scott Hall houses the Wilton E. Scott Institute for Energy Innovation as well as the Department of Biomedical Engineering, the Engineering Research Accelerator, the Disruptive Health Technologies Institute and the nanotechnology research facility. See who's who on Scott Hall's fifth floor. Scott Hall is located on the west side of Carnegie Mellon's Pittsburgh campus between Hamerschlag Hall and the FMS building, and adjacent to the west wall of Wean Hall. 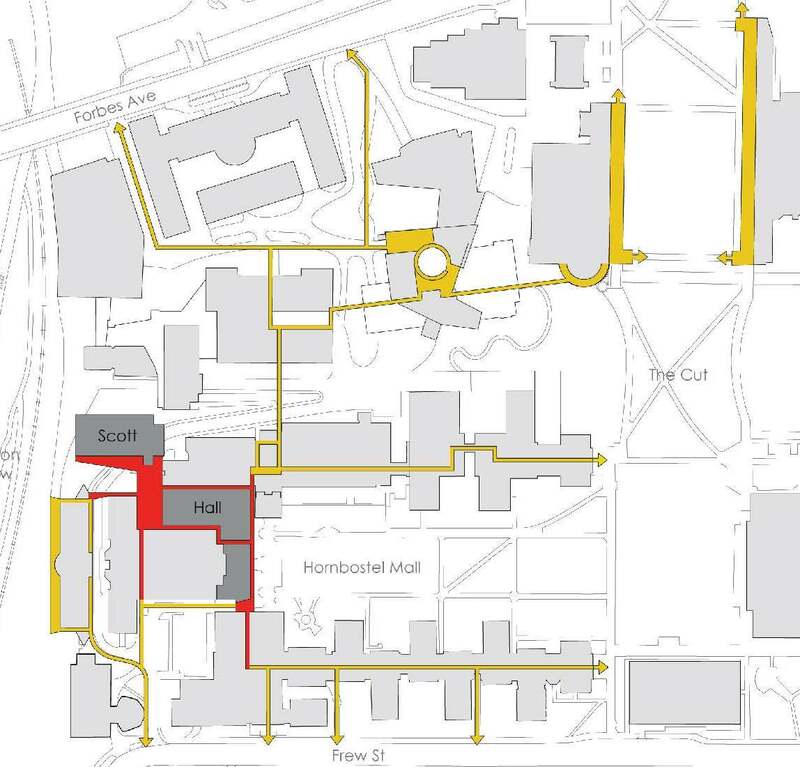 Scott Hall is normally accessible from entrances in Wean Hall, on Hamerschlag Plaza, and on Hamerschlag Drive. Currently, Wean Hall's main entrance is under construction. Hamerschlag Drive is also inaccessible from Frew Street due to construction. The closest parking available is the Pittsburgh Public Parking on Frew Street. 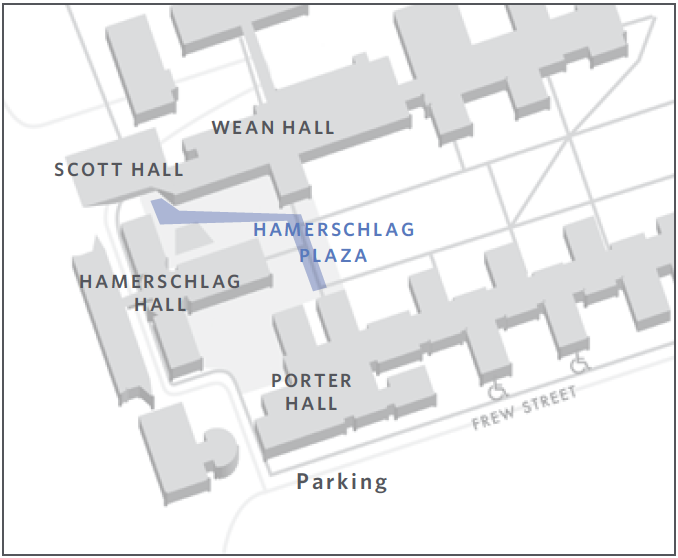 Walking from Frew Street through Porter Hall will lead you to Hamerschlag Plaza. From Hamerschlag Plaza, you will see Scott Hall ahead of you and to your left. If you're coming from another part of campus, you can enter Wean Hall and take the elevator or stairs to the fifth floor. From there, you can walk down Corridor 5100 (it houses the Institute for Software Research) and you will enter Scott Hall. Alternatively, a few other parking lots that provide a convenient access to Scott Hall are the CIC Garage, Gates Garage, and the East Campus Garage. If you park in the CIC Garage, we recommend you park on G4 toward the top and there is a plaza you can walk across to access the first floor of Wean Hall. Walk through the lowest door (both vertically and horizontally) and out the other side. You will now be in the mall area and you will see Hamerschlag Hall on your left. Go past it and you’ll see the diagonal walkway leading to Scott Hall. This is the 5th floor entrance. If you're looking for the Marquis Conference Room, proceed to the opposite side of the building and the conference room will be in front of you at the end of the hallway. Construction for the Sherman and Joyce Bowie Scott Hall began after the Scott Institute was established in 2012 with a founding gift from CMU alumni Sherman Scott (E'66), president and founder of Delmar Systems, and his wife, university trustee Joyce Bowie Scott (A'65). 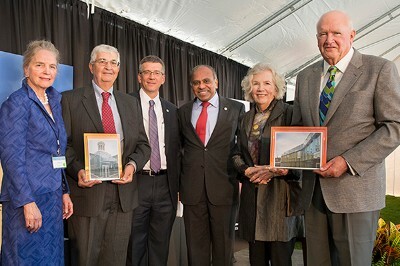 Additional support for the building as well as education and research in energy was provided by a generous grant from the Richard King Mellon Foundation of Pittsburgh in 2013. In addition to the Scotts, CMU received support for Scott Hall from CMU alumni John Bertucci (E'63, TPR'65) and his wife, Claire Ruge Bertucci (MM'65); CMU alumnus Jonathan Rothberg (E'85) and his wife, Bonnie Gould Rothberg; and the Eden Hall Foundation. Learn more about Scott Hall in our May/June Newsletter, at the Campus Design and Facility Development website or read the press release for its dedication.